The ball is SEALED IN ITS ORIGINAL BOX, the pictures of the ball are taken from an opened box. CAL RIPKEN AUTOGRAPHED COLLAGE - 2131 10th ANNIVERSARY W/AUTHENTIC PATCH-BEAUTY! CAL RIPKEN JR. AUTOGRAPHED COLLAGE - 2131 10th ANNIVERSARY W/AUTHENTIC PATCH. Beautiful Condition. 10th anniversary of possibly Baseball’s greatest feat ever. The autographed 8x10 is endorsed by three holograms. Ending Apr 22 at 4:33PM PDT2d 16hPlayer: Cal Ripken, Jr. ITEM IS NEW CONDITION. International Orders are Extra. A nice FOTOBALL with a COA and Cal's stats on the back. 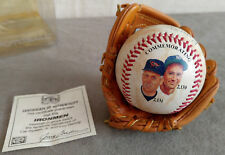 2 Vintage Mickey Mantel & Cal Ripken Jr Rawlings Commemorative Baseball Balls. Shipped with USPS Parcel Select Ground. 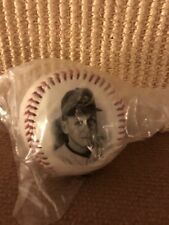 1995 Burger King Cal Ripken Jr. Fotoball Commemorative 3 Baseball Set with Stand. All in Very Good Condition from my Personal Collection and have been on my shelf since I purchased them way back in 1995. 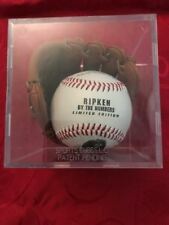 This is an official 2130-2131 Cal Ripken #8 ball still sealed in the original collectors box. In excellent condition. Free shipping. CAL RIPKEN JR. IRONMAN COMMEMORATIVE PHOTO BASEBALL WITH DISPLAY CASE!! 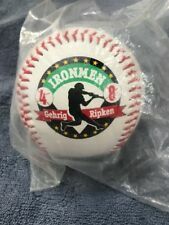 Cal Ripken Iron Man ball. Never been out of case. Has certificate of authenticity. Baseball in excellent condition. Case has a yellow tint. For sale is a "IRONMAN" Cal Ripken Jr. Autographed National League Baseball With COA. This Baseball has a Certificate Of Authenticity Done by SSCA with a Facsimile autographed ball number of #1,781 of #2,131. The ball is in a stiff clear plastic box. The box and the ball are both in a factory sealed, never open plastic bag. 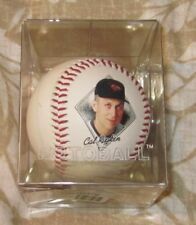 Clean no damage ball in clear plastic case..
Ironman Cal Ripken, Jr's Commemorative Autograph Baseball with C .O. A. Never been open. In great condition. Still in Box. Unopened very nice cal Ripken Jr signed ball no date. Imagine this ball signed by Frank Thomas (1993 & '94 MVP), Dennis Eckersley (1992 MVP) winners and on and on. - all HOFs! What a classic to marry a players greatest triumphs with the ball of that year. SOUVENIR BASEBALL. FOTOBALL - LIMITED EDITION OF 5,000. If you are purchasing more than one. RIPKEN, 3000 HITS - APRIL 15, 2000. SOUVENIR BASEBALL. STILL IN UNOPENED BAG. If you are purchasing more than one. 1995 - CAL RIPKEN JR # 8 Orioles Limited Edition - Baseball Ball Burger King with black stand. Photos are also a good way to describe our products. We are here to serve you. Baseball has authentic facsimile of his signature. Never opened. Cal Ripken not signed ball. 17127-p -SR-. Ending Apr 25 at 1:13PM PDT5d 13hPlayer: Cal Ripken, Jr.
Cards are very good condition. SA3 04/19. You are looking at a Rawlings 1996 division series baseball. This is an unopened box. NOTE: We do not know the condition of the baseball as these are unopened boxes. We do our best to describe an item's condition in our own opinion but it may not match your standards. Cal Ripken Jr. Autographed Bat, Baseball, Photo. 2131 game streak ticket stub. Cal Ripken Jr. is a legend who was inducted into the HOF in his first eligible year. I was never a Baltimore Oriole but always respected the classy player he was. But enjoyed having this as part of my collection. We are inundated with inventory and trying to liquidate. The balls and the stand are all sealed in clear plastic. Never opened. The pictures you see are of the actual item you will receive. It will destroy the original value. within 24 hours of receiving the item. Commemorative Cal Ripken Jr. baseball in case. Shipped with USPS Parcel Select Ground. New in box, Cal Ripken Jr. #8 Orioles Commemorative Baseball. Never been opened. Rawlings brand. Enjoy! Disclaimer: All items are sold as is. Please see photos for specific item and any potential defects. No returns or refunds. Happy Shopping! Ending Saturday at 12:50PM PDT12h 54mPlayer: Cal Ripken, Jr.
Cal Ripken Jr. 2131 September 6, 1995. by Fotoball. Record Broken Sept. 6, 1995 vs. Angels Oriole Park at Camden Yards. From the late 1800's to current product we can use it all! For larger deals we will travel to you. The ball itself includes a black stamp of the official "Ripken 2130-2130" logo and gold stitching in honor of Ripken's Baltimore Orioles. (2130 and 2131). Great for future autographs or to save and display as is. The Cal Ripken Jr.